Site Work, Land Clearing in Lake Conroe l Dirtwirx Inc. Many people dream of having a lakeside vacation home, but gorgeous Lake Conroe has plenty of opportunities for you to build a luxury year-round residence in its banks. 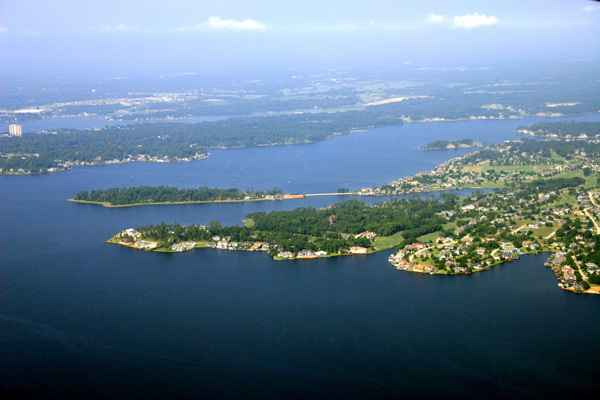 The lake’s many inlets give it an extensive shoreline, so you can be a hop, skip and a jump away from a relaxing day on the water no matter where you build your home in the Lake Conroe area. To make your luxury home a reality, you’ll want to start off on the right foot before you even break ground, and that means partnering with Dirtwirx. Our experienced teams can prepare your lot for utility lines, clear away any trees or potentially problematic root systems, ensure there are no low spots in the area where water will pool after rainfall, and more. And if you already have a beautiful home on Lake Conroe, you can still benefit from Dirtwirx’s services. Our tree removal and stump grinding services are useful for any homeowner, whether your lot is large or small. We can also install driveways, culverts, or building pads for sheds, garages and barns. For businesses that operate along the lake, such as golf courses or country clubs, our land clearing, hydro-axing and pond digging teams can handle large projects and renovations, keeping your property looking its best at all times. Our fast line-item estimates are leading the industry in transparent communication, meaning you will always know what you’re paying for. No hidden fees, no surprises. We also offer a Net 30 payment option so that you can make staggered payments over the course of 30 days.